One night in Bangkok.....: Transformers: More than meets the eye! Transformers: More than meets the eye! That's for sure! Last week, I was at Bannok having a few beers with with Tony. It was pretty quiet night, and we were just yakking on about this, and that, when in walked a group of about 12 or so ladies. The first thing that struck me, was how tall most of them were. At a guess, I would have said that the smallest one could have pretty much looked me in the eye. The second thing that struck me, was that as they walked by, one of them said "Hi". 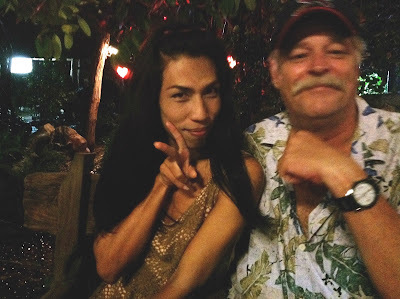 It wasn't the fact that most Thais are scared to death of any type of social interaction with foreigners, and it wasn't the fact that her English sounded pretty good, it was the fact that I would put the sound of her voice somewhere between Chyna and James Earl Jones. Ladyboys! I don't know why they do what they do, but I really don't give it much thought either. I have to admit that as far as most of the population around here goes, they are a hell of a lot more fun to be around. The over the top drama, the exaggerated style, all of it. These girls were out to have fun, and they did. Apparently, it was one of their birthdays, because the small one went around to all the tables handing out little squares of birthday cake. Most everyone graciously accepted, but a few patrons were rather snotty while refusing. No worries though, because she matched them glare for glare, and dismissive snort for dismissive snort. Meanwhile, the rest of the katouey were having a blast, singing deep throated karaoke, and getting just about as rowdy as any of the guys would have dared to. When cake girl got to our table, Tony and I were each spoon fed a few pieces of the community cake. The extra attention even got us a few glares of our own. I see them as little victories. While she was there, I got Sheena of the jungle to sit down let Tony take a shot of us with his iPad. It turned out kind of fuzzy, but it's really hard to get a good photo in that place for some reason. Afterwards, she gave me a good squeeze, and off she went.